Here on the Franklin Farm the stillness of winter days is interrupted by the twice daily rhythm of chores. Our alarm clocks announce the arrival of 4:30 am. And the day starts for whoever is milking. Out to the barn by 5, the cows are roused from their beds and brought in to the barn for milking. 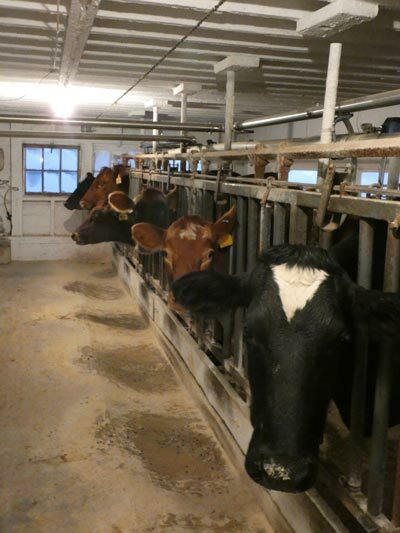 It doesn’t take long for the cows to take the chill off the barn. Thirty-six 1000 pounds animals with body temperatures of 101.5 throw off quite a bit of heat. The stanchions rattle as the cows eat their few pounds of grain which is doled out at every milking. The amount of grain they receive is based on the amount of milk they are producing and their stage of lactation. Dairy cows are funny creatures. There is no doubt in my mind that they enjoy the milking times of the day. The herd is usually very willing to come into the old milking barn and be hitched in stanchions and headlocks. Their confinement is only temporary. They are served their grain and milked and out they go again. Two of us work our way down the barn with 3 milking machines apiece. From one end of the barn to the other and back again we clean their udders and harvest the milk they have produced. It is a good time to observe them and visit –with them and with the person your milking with. The barn radio plays country music. This reminds me, one of the funniest cow moments I have ever experienced, happened many years ago at Christmas time, while I was milking. There used to be a silly rendition of Jingle Bells sung by dogs barking. One morning it came on the barn radio and many of the cows started looking around as if to see if the farm dogs, who are often in the barn with us, were singing it! It was fun to be there and catch that moment of bovine curiosity and intelligence. Dairy cows are nice animals to work with. They all have unique personalities and for the most part are amiable. I have always felt fortunate to be able to farm and experience the partnership between our cows and us. We depend on them and they depend on us. We take very good care of all of them throughout their lives, and they in turn, take care of us. Milking takes about one and a half hours. Once that’s done, it’s time to feed everyone in their bunks outside and make sure their barns and beds are clean. One person does that while the other one set up the milk room to wash and cleans the stable after the cows have gone back out. Finally the laying hens are fed and watered, eggs are collected and brought to the farm store and boxed, and it is time to head home to sit down and have some breakfast. The hours until afternoon chores start at around 3pm are spent doing all the other jobs that need doing on our diversified family farm. The guys spend lots of time in the winter managing the manure that is stacked up till spring, bedding free stalls, hauling sawdust, bookkeeping, running errands and endless other jobs. An especially good winter day includes a substantial nap at lunch time. Winters can be long. It feels good that the shortest days of the year are behind us and each day we experience minutes more of daylight. By the end of this month the difference becomes easily noticeable. By then we will be out in the woods and getting ready for the Maple sugaring season. Anticipation and preparation for the sap flow raises our winter chilled spirits. As we travel through the seasons on our diversified small family farm, no two days are exactly alike. It keeps life interesting, challenging, and rewarding all at the same time. These are challenging days for farmers. Dairy, grain, vegetable, livestock, and farmers of all types are under the pressures of changing climates and unpredictable weather, government policy and regulations or the lack thereof, economics, corporate competition, and countless of other pressures. I mention this because every day we feel lucky we are still able to farm here. That success comes not only from our efforts but from our friends, neighbors and community(near and far) that supports and appreciates us. Thank you from the bottom of our hearts! We wish you and your families happiness and health and the all the best that life can bring in the New Year and beyond!